If you feel that your children need to learn to manage money before receiving their inheritance, the Capital Growth Trust is an excellent estate planning technique. It conveys an inheritance to your children while giving them time to mature financially. An additional blessing is that it almost doubles the amount of the estate. As you compare a conventional plan (a simple will) with a maximized plan using the Capital Growth Trust, you will note an amazing difference. 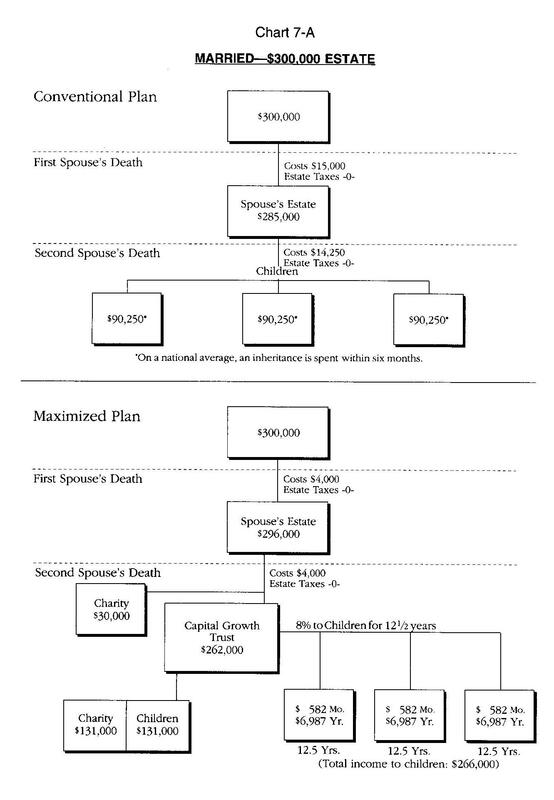 Review Chart 7-A, "Married—$300,000 Estate," and Spreadsheet 7-A "Married-$300,000 Estate." Even though $300,000 may seem like a large amount, this sum represents a moderate size estate. When you consider the total value of your home, insurance policies, and other assets, you will find your own estate to be quite substantial. But regardless of the size of your estate, the same principles apply. Under the maximized Capital Growth Trust plan, the heirs receive $393,000—an incredible increase of $122,250 over the conventional plan. In addition, a total of $161,000 is designated for charitable gifts. The maximized plan has increased the estate by almost 85 percent. It is evident that the Capital Growth Trust is a tremendous technique for avoiding the dissipation of an estate within a short period of time. Review Chart 7-B, "Single—$300,000 Estate," and Spreadsheet 7-B "Single--$300,000 Estate. 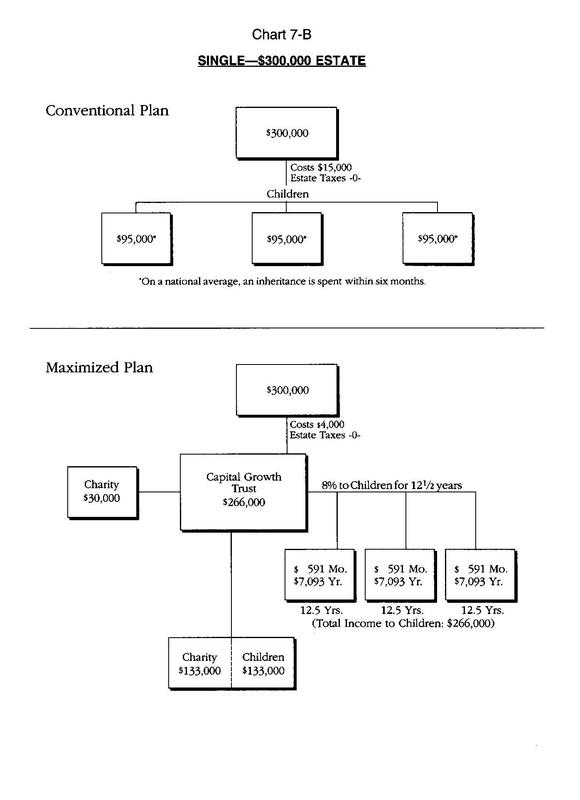 This chart shows the way a single parent’s estate would be managed under both the conventional plan and the maximized plan. Many people spend a great deal of time trying to reduce their income tax liability. Income tax rates run anywhere from 15 to 31 percent, but estate tax rates are an astronomical 37 to 55 percent. Although the planning for a $600,000 estate may not seem applicable to your situation at this time, more and more people are reaching these estate values—perhaps through business successes or through an inheritance. Through sophisticated planning, people with an estate value of between $600,000 and $1.2 million will be able to preserve the assets God has entrusted to them and not pay any estate tax. No taxes are paid on the estate of the second spouse to die. The estate goes tax-free to the children. 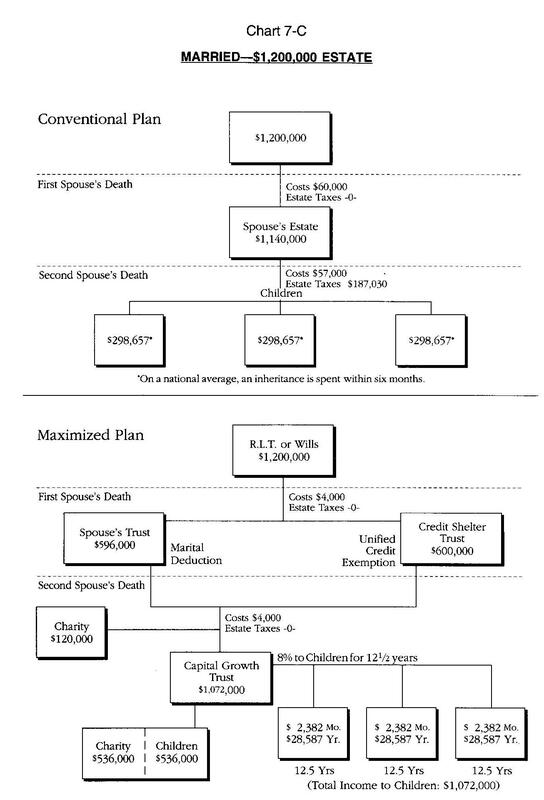 Review Chart 7-C, "Married—$1,200,000 Estate" and Spreadsheet 7-C, "Married—$1,200,000 Estate. "The $1.2 million dollar figure is used because it is the total of the husband and wife’s individual $600,000 exemptions. Now compare the use of a simple will with a maximized plan using the Credit Shelter Trust. Instead of selling the property and paying the tax, you could transfer the property to a Charitable Remainder Unitrust and let the trust sell the property. The trust pays its remainder interest to charity, thereby giving you a charitable deduction in the year that you transfer it. You are exempted from the capital gains tax because of the charitable contribution. The original amount put into trust will stay there for a number of years, paying both you and your spouse an income for both of your lifetimes. The trust will also act as a hedge against inflation, because each year the excess accrued is added to the trust. The original amount will be removed from the probate estate and is removed from the estate for federal estate tax purposes. Eventually you will benefit a worthy cause. After two lifetimes (or some other period of time you select), the trust principal (which has increased) is paid to the charity or charities of your choice. The uses of a Charitable Remainder Unitrust are really only limited by the needs and desires of a couple and the expertise of their attorney. By changing certain terms, like the amount of payout and the number of years, the trust can be used as a retirement vehicle, or as a means to provide money for the children’s education. See Chart 7-D, "Charitable Remainder Unitrust," at the end of this chapter. Everyone needs a document finder. This information simply tells where important documents are found. Make your own document finder by including the following information in a composition book or a ledger. Then place a copy in your safe deposit box and a copy in a prominent place in your home. Be sure to let your family know where these documents are located.